Welcome to the What's New page of the Digital South Asia Library. Look here for periodic updates about new resources, on-going projects and other news. DSAL has partnered with the Universitätsbibliothek Heidelberg in Germany to host the page images from the Hitesranjan Sanyal Memorial Archive collection of Bengali periodicals. The journals were scanned by the Centre for Studies in Social Sciences, Calcutta (CSSSC), with support from DSAL and the South Asia Microform Project (SAMP) of the Center for Research Libraries. DSAL is currently receiving index records for a portion of these journals and will link from the index records to the volume-level digital files hosted by Savifa: Virtual Library South Asia. DSAL continues to collaborate with Professor Tsukasa Mizushima of Tokyo University to digitize additional maps from the Survey of India. DSAL has received a portion of these scans and is preparing to process and present them. Among the maps provided by Professor Mizushima are so-called gaihozu prepared by the Japanese military during WWII. 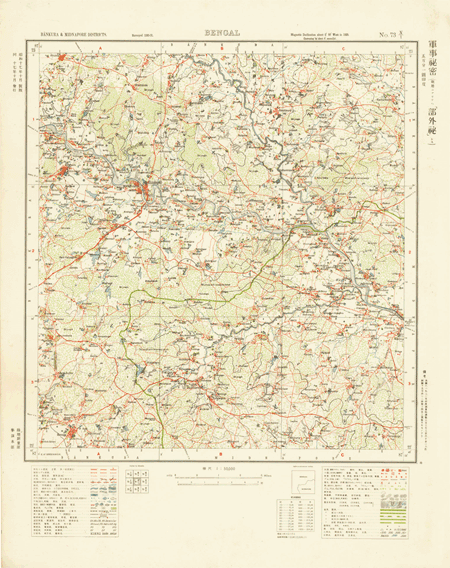 These maps are Survey of India maps printed with annotations in Japanese along the neatlines. The image below is an example. As part of its four-year grant from the US Department of Education for Technical Innovation and Cooperation for Foreign Information Access entitled "Audio, Maps and Images from South Asia", DSAL has begun to receive scans of historical postcards produced by the International Dunhuang Project. The postcards are from the collection of Mr. Graham Shaw, former Head of Asia, Pacific, and Africa Collections at the British Library. They represent a wide variety of life in colonial South Asia, including scenes of ordinary daily activities as well as extraordinary occasions and locations that appealed to tourists and British residents. Among the collection are images produced by well-known photographic firms such as Gobindram Oodeyram in Jaipur. The following images are a small sample of these invaluable historical artifacts. For a larger view please click on the thumbnail images below. 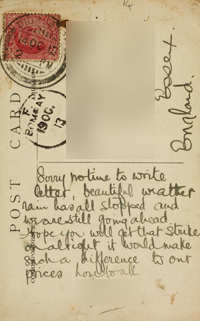 In addition to the recto's of the postcards, DSAL will present, in an anonymomized form, text added to the verso of the postcards with the hope it might help us understand of what these images meant to those who sent them. The verso to the right of the recto below is an example of the kind of text that will be presented. For a larger view please click on the thumbnail images below. 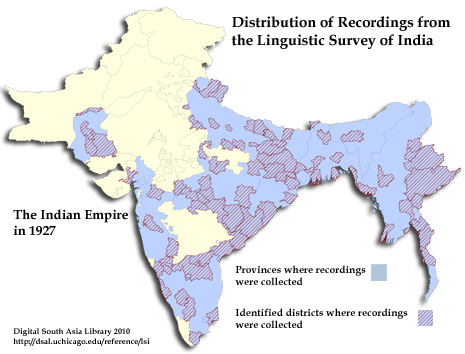 It is our pleasure to announce that the resource Gramophone Recordings from the Linguistic Survey of India is now fully linked to DSAL. Gramophone Recordings from the Linguistic Survey of India consists of digitized recordings originally collected in South Asia during a period from 1913 until 1929. Intended as a supplement to Sir George A. Grierson's Linguistic Survey of India published between 1904 and 1927, the recordings of stories, songs and poems were collected by provincial and presidential governments of British-ruled India in cooperation with Grierson and the Gramophone Company, Calcutta.